The Jazz got outworked, out-hustled and outplayed last night against the Rockets. Back in the day, we used to pride ourselves on being the blue-collar, tenacious, hard-working team. Not anymore. The Rockets have officially stolen that moniker from us. And truth be told… we haven’t been that sort of team for some time now. The Rockets were the unheralded, underappreciated, hardworking blue-collar team last night. Evidence of this truth was through the play of the Rocket power forwards (the lethal triumvirate of Luis Scola, Chuck Hayes and Carl Landry) who utterly outplayed our studs, Carlos Boozer and Paul Millsap. Combined, Millsap and Boozer went for 9 points and 16 rebounds. The Rocket trio scored 36 points, recovered 30 rebounds and blocked 3 shots combined. Sometimes I wish we had more players like those on the Rockets. They just play hard, play together and don’t care who scores the ball. Seven players scored in double figures for the Rockets. Our best performance on the Jazz came from Memo, who despite injury and slow maneuvering still found the bucket for 21 points. Ronnie Brewer continues to play well also with 19 points. The 4th quarter was just ugly last night. We got blitzed!... And it was on our home floor, no less. Now we have to play the 2nd half of a back-to-back against Dallas tonight… on the road. Scary! 1) We got worked by rookie (44th pick at that) Chase Budinger. Nobody could stop him. Chase Budinger. Forget AK as the "Kobe-Stopper." Now we need a "Chase-Stopper." 2) Boozer and Milsap were dismal, lethargic, retarded, distant, whatever you want to say. Boozer couldnt catch a pass, couldnt make a shot, couldnt play a lick of defense. Oh how I wish he had opted out. He looks worse than I have ever seen him. Luis Scola completely dominated him. Not Dwight Howard, but Luis Scola. 3) D Will is the real deal. Too bad he has to do this alone. 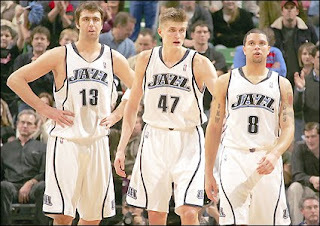 4) I predict that the Jazz win 39 games this season, unless something is fixed quickly. I was so depressed when i left the Tox Box last night. It is hard to start the season with low expectations. I watched the whole game last night and was equally disappointed. We look terrible. Getting blown out at home. . . that's not something that happened even at last year's low point. Boozer looks terrible. He can't even get a shot off, let alone make one. We've got to move him. And I'm sure teams are lining up for an overpaid, crappy power forward with an attitude who doesn't play defense. Silver linings: AK's play, the fact that D Will was getting hammered and not getting calls (including the turning point BS offensive foul on Battier), the fact that Houston hit just about every three they took. Non-silver linings: Our defense is awful, we folded in the 4th quarter again (that's twice in three games), we just don't seem to have that much talent. This was an actual Ron Boone quote from last night -- "Ronnie Brewer was great from beyond the arc last year. He shot 26%." Pause. "Well, 26% actually isn't that good, but it's better than he shot the year before." OK bipolar fans, step away from the cliff. A. Houston is a good team and a terrible matchup for us. They have guys to bang with our PFs and they have a ton of shooters. We don't guard shooters. B. Let's not start saying things like this is a worse loss than anything from last year. We lost to the Clippers (at home) that cost us a much better seed. C. If Boozer plans on tanking, he is only shooting himself in the foot. We're already looking towards the future. He will get it together. D. Chase Budinger played Olympic-level volleyball. Question: I heard that the ex-Delta Center was pretty vacant. True? Fact: We lost eight times at home last year, and only once by 17 points or more. So in essence we've equaled our worst home loss of last year's season in the third game of this year. Yes, it was only one game. But it does not bode well because we weren't missing any key players and while Houston is good, there are plenty of teams that are as good or better than they are. I was at the game, and it was fairly empty. At the tip it was very empty, but by the time everyone that was there filed in it filled up a bit.